Will this work with KB-1? @Keenan on the app store version of KB1 there are large cpu spikes when using with SC. However, I've been working with Kai on this and he has fixed it (in KB1 beta), so you might want to wait until the next KB1 update is out before using it for anything critical. I didn’t get SG before as it wasn’t playable, but now it appears that it is, so I may have no excuse! How does it compare with Quanta (which I really like)? Does it offer anything you can’t do with Quanta? 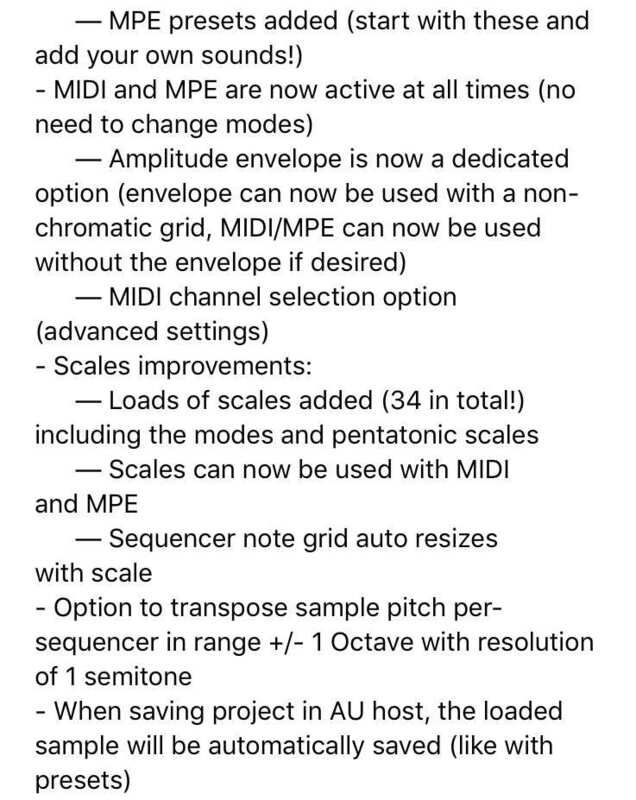 This sounds like a "Game Changer" for quick loading of instruments for me. I loaded a Cello note and got some quick and gorgeous string sounds in a few seconds. Just digging through wave samples and looking for something interesting could become a way to kick start a lot of new tracks for acoustic and ambient projects. Adding some ADSR settings would make this use case even more compelling. The attacks are gentle to slow... not really a biting sound. Any clues how that might be addressed... maybe with another FX App for an envelope? @McD not sure if I understood what you were after but you could try setting the grain panel crosshairs top right and the envelope crosshairs bottom left with maybe a little release. Then you can play fast via midi if you wish. Can you tell exactly which controllers SC is expecting for MPE? I'm using a KMI QuNexus; it's not officially an MPE controller as it only sends two controls per note (tilt and pressure), but with channel rotation it should mostly work. I can get get the pitch bend per note working either controlling pitch or grain position depending on the MPE Pitch / MPE Grain setting, but I can't get the other controls to do anything. Knowing what SC is expecting would help. 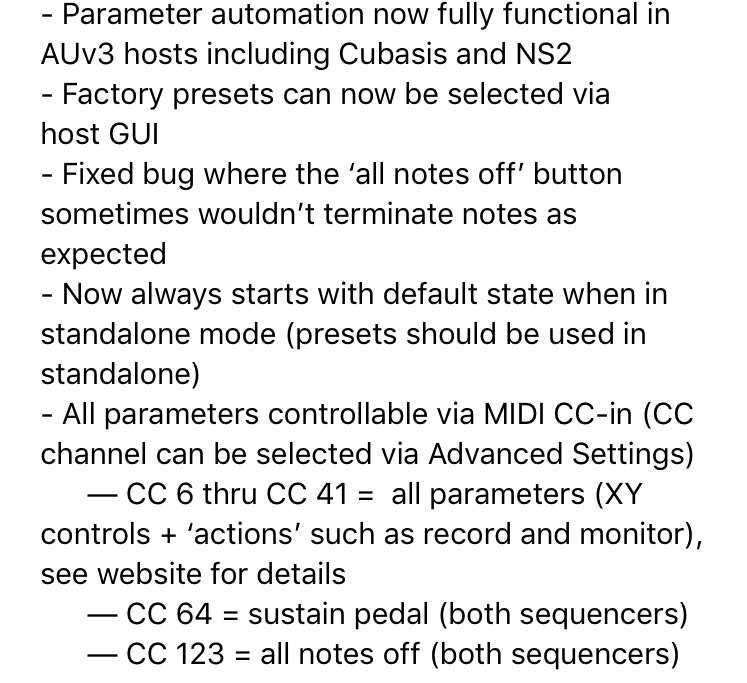 Also, I don't see the MIDI CC control list on your website as mentioned in the update notes. Yes. That's what I was missing... the little envelope box on the lower left in the GUI. I do however want more Decay after a fast attack to make a popping sound like a marimba. I might have an app that will provide more of a "pop" with the attacks. Maybe "FAC Transient"... If anyone has advice I'm listening. "Objec" maybe? 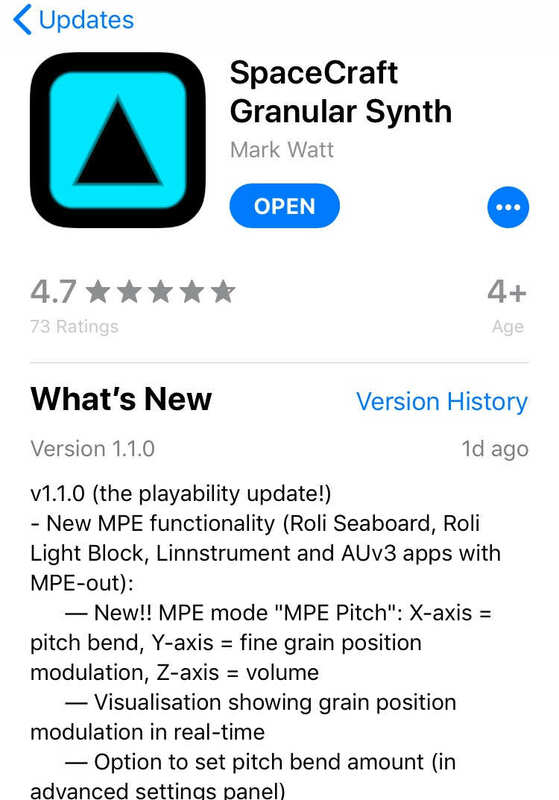 That combination would make this the type of sound design app I just love... twiddle a few crosshair controls and find a really useful percussive instrument like marimbas made from glass, plastic or mailing tubes. Mark, you're GUI is genius and these new MIDI features are amazing. I haven't even touched the MPE stuff yet and I'm already totally excited by the potential to dial in something cool, Running 2-3 of these with MIDI Genarators should produce some unique results fast. This is way beyond Granular now. 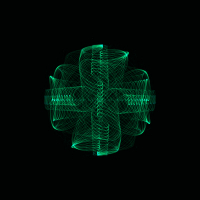 I can sequence faster patterns with clarity. I'm sure this has been there for months and I didn't complain with the right terms. Z axis is channel pressure but if I recall correctly it also listens to channel afterthouch just incase the device doesn't use channel pressure. Do you have per note volume contol using the qunexus? Sorry about the missing website info I was supposed to do that after release but I got distracted by an issue and completely forgot the website !! Good point about envelopes - I can’t see any envelope control? I’m interested in the two factory audio files in SpaceCraft. How did you choose the sounds? How were they created/recorded? Why are they both exactly 2:01.904 mins in length? Great! I thought I had tried that and couldn't get it to work, but now I'm verifying that it is working. In addition to note-on velocity, the QuNexus can respond to two other controls: finger pressure and finger tilt. These sensor readings can be mapped to any MIDI control and with channel rotation enabled you get rudimentary MPE. Not as nice as other controllers as I only have three controls instead of the five from a Roli or Linnstrument, but still very cool. In MPE Grain mode is it just: X-axis = grain position and Z-axis = volume? Y Axis doesn't seem to be matched to anything. Any chance of mapping that to pitch? I prefer the larger scale grain position control of MPE Grain, but some pitch variation would be nice too! Man the seaboard block and spacecraft combo is so great, I get lost for hours! Great update! Wonderful update, thanks for your hard work! Ah, cool. There’s info about the included audio samples too. Hadn’t spotted that before. @deltaVaudio Hello! thank you for your awesome app! I can't record automation in Cubasis for seq0_mainpanelX and Y. other parameters are recording fine as well as seq1_mainpanelX and Y.
looking forward to a cubasis update when everything might be automatable easily.. Thanks so much for the update! This is exactly what I’ve been waiting for. Now, I’m very,very pleased to confirm that you can record your SpaceCraft UI gestures/automation etc straight into NanoStudio2’s timeline for more detailed tweaking/playback. Previously you could only do this by using the NS2 performance knobs/XY pad. But now the actual SpaceCraft UI controls seem to be properly mapped (once you map them to NS2’s macros) so that any move you make is recorded as NS2 instrument automation. This is fantastic! Whoop whoop. I'd like to write the libretto for this.